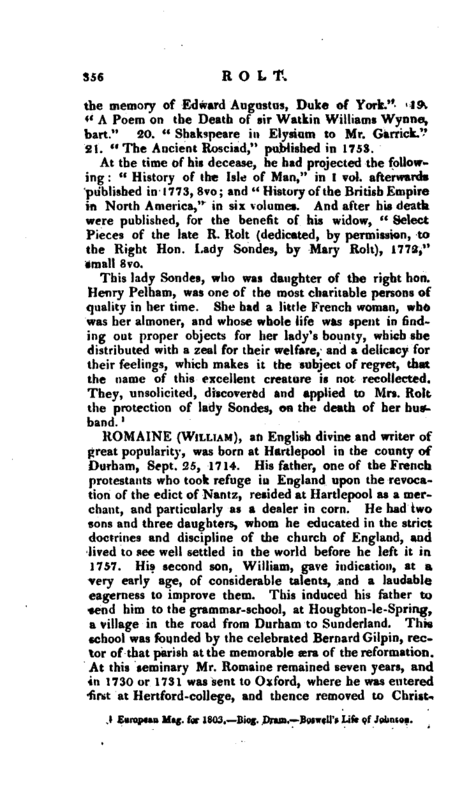 , an English divine and writer of great popularity, was born at Hartlepool in the county of Durham, Sept. 25, 1714. His father, one of the French protestants who took refuge in England upon the revocation of the edict of Nantz, resided at Hartlepool as a merchant, and particularly as a dealer in corn. He had two sons and three daughters, whom he educated in the strict doctrines and discipline of the church of England, and lived to see well settled in the world before be left it in 1757. His second son, William, gave indication, at a very early age, of considerable talents, and a laudable eagerness to improve them. This induced his father to send him to the grammar-school, at Houghton-le-Spring, a village in the road from Durham to Sunderland. This school was founded by the celebrated Bernard Gilpin, rector of that parish at the memorable acra of the reformation. At this seminary Mr. Romaine remained seven years, and in 1730 or 1731 was sent to Oxford, where he was entered first at Hertford-college, and thence removed to | Christchurch. He resided principally at Oxford till he took his degree of master of arts, Oct. 15, 1737, having been ordained a deacon at Hereford, a year before, by Dr. Egerton, bishop of that diocese. His first engagement was the curacy of Loe Trenchard, near Lid ford in Devonshire. In the year following he appears to have been resident at Epsom in Surrey, from the date of a letter from him, Oct. 4, 1733, to rev. William Warburton, upon the publication of his “Divine Legation of Moses.” In the same year he was ordained a priest by Dr. Hoadly, bishop of Winchester. 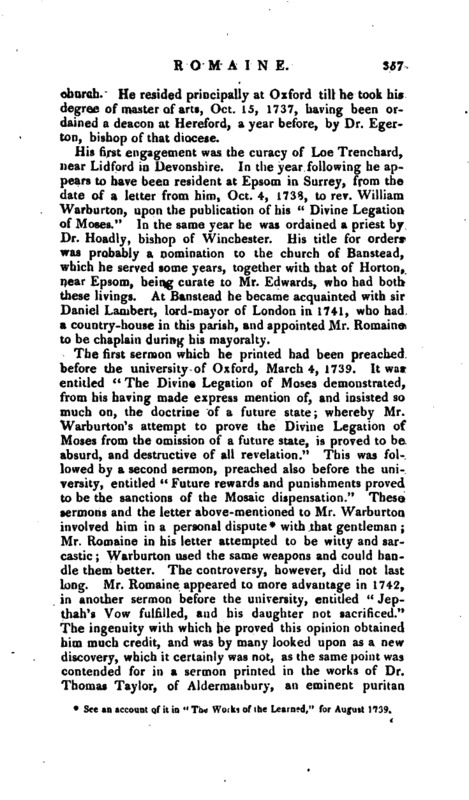 His title for orders was probably a nomination to the church of Banstead, which he served some years, together with that of Horton, near Epsom, being curate to Mr. Edwards, who had both these livings. At Banstead he became acquainted with sir Daniel Lambert, lord-mayor of London in 1741, who had a country-house in this parish, and appointed Mr. Romaine to be chaplain during his mayoralty. See an account of it in “The Works of the Learned,” for August 1739.
with that gentleman Mr. Romaine in his letter attempted to be witty and sarcastic; Warburton used the same weapons and could handle them better. The controversy, however, did not last long. 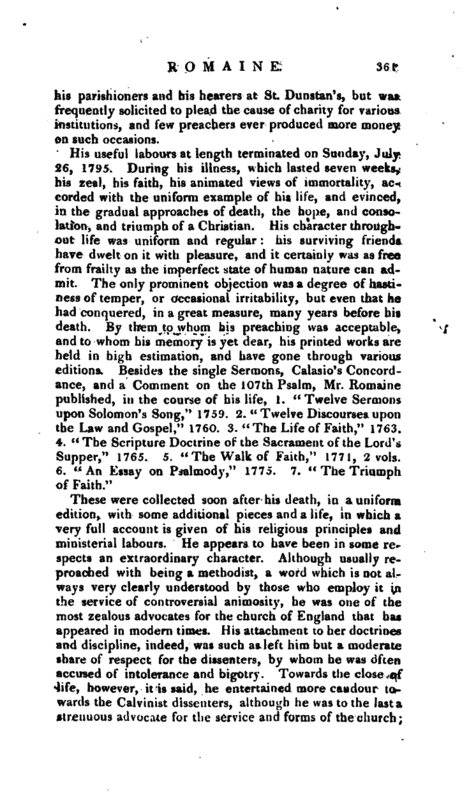 Mr. Romaine appeared to more advantage in 1742, in another sermon before the university, entitled “Jepthah’s Vow fulfilled, and his daughter not sacrificed.” The ingenuity with which he proved this opinion obtained him much credit, and was by many looked upon as a new discovery, which it certainly was not, as the same point was contended for in a sermon printed in the works of Dr. Thomas Taylor, of Aldermanbury, an eminent puritan | divine, who died in 1632. Besides other sermons before the university, he preached one in 1757, entitled “The Lord our Righteousness,” in consequence of which he was refused any future admission into the university pulpit. He interpreted the articles of the church in the strict Calvinistic sense, which at this time gave great offence. 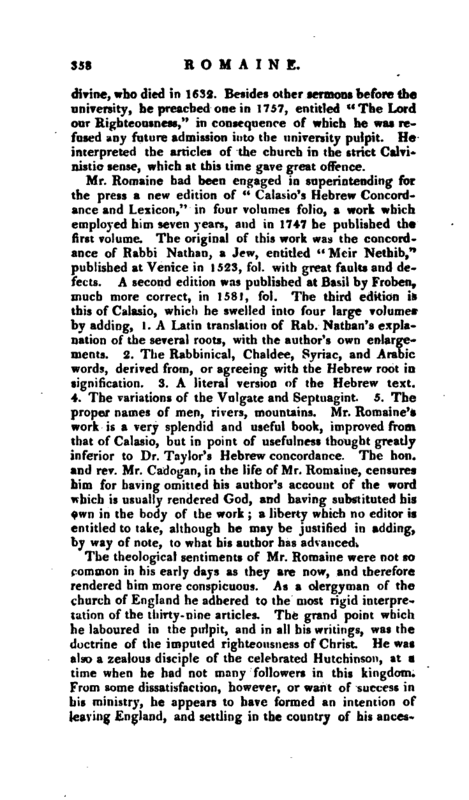 Mr. Romaine had been engaged in superintending for the press a new edition of “Calasio’s Hebrew Concordance and Lexicon,” in four volumes folio, a work which employed him seven years, and in 1747 he published the first volume. The original of this work was the concordance of Rabbi Nathan, a Jew, entitled “Meir Nethib,” published at Venice in 1523, fol. with great faults and de- 1 fects. A second edition was published at Basil by Froben, much more correct, in 1581, fol. The third edition is this of Calasio, which he swelled into four large volumes by adding, l. A Latin translation of Rab.’ Nathan’s explanation of the several roots, with the author’s own enlargements. 2. The Rabbinical, Chaldee, Syriac, and Arabic words, derived from, or agreeing with the Hebrew root in signification. 3. A literal version of the Hebrew text. 4. The variations of the Vulgate and Septuagint 5. The proper names of men, rivers, mountains. Mr. Romaine’s work is a very splendid and useful book, improved from that of Calasio, but in point of usefulness thought greatly inferior to Dr. Taylor’s Hebrew concordance. The hon. and rev. Mr. Cadogan, in the life of Mr. Romaine, censures him for having omitted his author’s account of the word which is usually rendered God, and having substituted his own in the body of the work; a liberty which no editor is entitled to take, although he may be justified in adding, by way of note, to what his author has advanced. The theological sentiments of Mr. Romaine were not so common in his early days as they are now, and therefore rendered him more conspicuous. As a clergyman of the church of England he adhered to the most rigid interpretation of the thirty-nine articles. The grand point which he laboured in the pulpit, and in all his writings, was the doctrine of the imputed righteousness of Christ. He was also a zealous disciple of the celebrated Hutchinson, at a time when he had not many followers in this kingdom. From some dissatisfaction, however, or want of success in his ministry, he appears to have formed an intention of leaving England, and settling in the country of his | ancestors. He was prevented from executing this design, by what he piously deemed a providential interposition. He had actually made the necessary preparations, and wa going to the water-side, in order to secure his passage^ when he was met by a gentleman, a total stranger to him, who asked him if his name was not Romaine. He answered that it was. The gentleman had formerly been acquainted with his father, and, observing a strong resemblance tot him in his son, was induced to make the inquiry. After some introductory conversation, he told him, that the lectureship for the united parishes of St. George’s Botolphlane and St. Botolph’s Billingsgate was then vacant; and that, having some interest in those parishes, he would exert it in his behalf, if he would become a candidate for the lectureship. Mr. Romaine consented, provided he should not be obliged to canvass in person; a customwhich he always thought inconsistent with the character of a clergyman, and against which he openly protested many years afterwards, when he was candidate for the living of Blackfriars. He was chosen lecturer of St. Botolph’s in 1748, and the year following lecturer of St. Dunstan’s in the West. In the person of his predecessor in the latter (Dr.Terrick), two lectureships were united: the onefounded by Dr. White, for the use of the benchers of the Temple; the other a common parish lectureship. 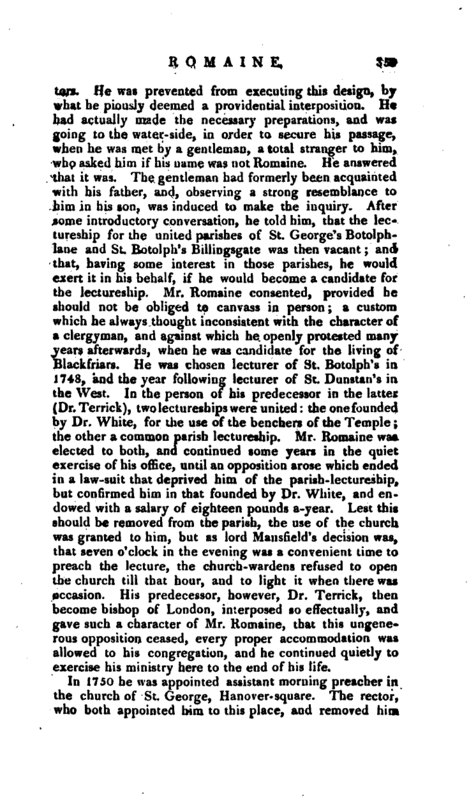 Mr. Romaine wai elected to both, and continued some years in the quiet exercise of his office, until an opposition arose which ended in a law-suit that deprived him of the parish-lectureship^ but confirmed him in that founded by Dr. White, and endowed with a salary of eighteen pounds a-year. Lest this should be removed from the parish, the use of the church was granted to him, but as lord Mansfield’s decision was, that seven o’clock in the evening was a convenient time to preach the lecture, the church-wardens refused to open the church till that hour, and to light it when there was occasion. 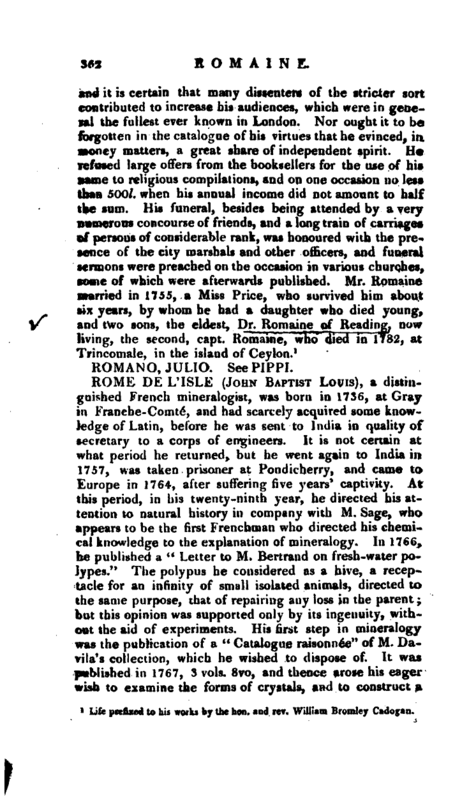 His predecessor, however, Dr. Terrick, then become bishop of London, interposed so effectually, and gave such a character of Mr. Romaine, that this ungenerous opposition ceased, every proper accommodation was allowed to his congregation, and he continued quietly to exercise his ministry here to the end of his life. 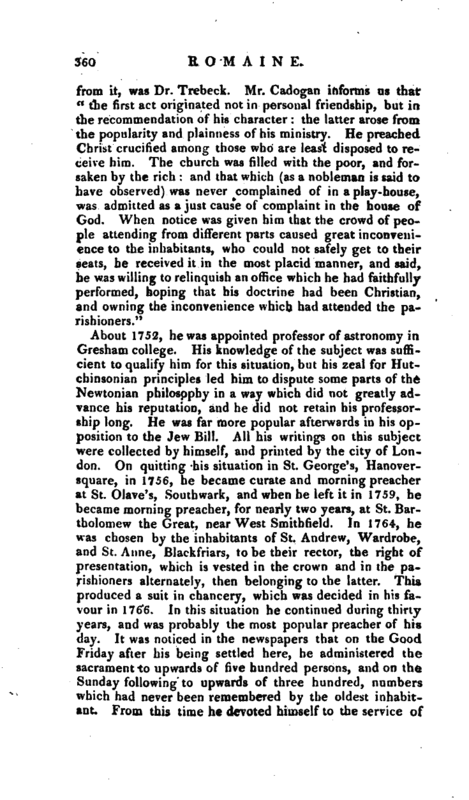 About 1752, he was appointed professor of astronomy in Gresham college. His knowledge of the subject was sufficient to qualify him for this situation, but his zeal for Hutchinsonian principles led him to dispute some parts of the Newtonian philosophy in a way which did uot greatly advance his reputation, and he did not retain his professorship long. He was far more popular afterwards in his opposition to the Jew Bill. All his writings on this subject were collected by himself, and printed by the city of London. On quitting his situation in St. George’s, Hanoversquare, in 1756, he became curate and morning preacher at St. Olave’s, Southwark, and when he left it in 1759, he became morning preacher, for nearly two years, at St. Bartholomew the Great, near West Smithfield. In 1764, he was chosen by the inhabitants of St. Andrew, Wardrobe, and St. Anne, Blackfriars, to be their rector, the right of presentation, which is vested in the crown and in the parishioners alternately, then belonging to the latter. This produced a suit in chancery, which was decided in his favour in 1766. In this situation he continued during thirty years, and was probably the most popular preacher of his day. It was noticed in the newspapers that on the Good Friday after his being settled here, he administered the sacrament to upwards of five hundred persons, and on the Sunday following to upwards of three hundred, numbers which had never been remembered by the oldest inhabitant, From this time he devoted himself to the service of | his parishioners and his hearers at St. Dunstan’s, but was frequently solicited to plead the cause of charity for various institutions, and few preachers ever produced more money on such occasions. Life prefixed to his works by the hen. and rev. William Bromley Cadogan.